Okay - this place really is gorgeous! 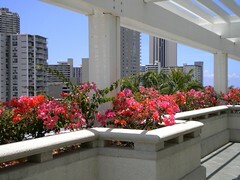 We're staying at the Hilton Hawaiian Village, and our conference is at the Convention Center. Even the Convention Center is gorgeous! I could deal with seeing that every day, that's for sure. Woah, it's like SO sunny!!! TV commercial sunny! I bet you are seeing our friend Jo from Peoria aren't you too?! Did I tell you I was going to Hawaii?